This is a pocket photo I made in late January. As you can see, my daughter Anabee is doing a little drawing while we head to the grocery store. She had just started in with her habit of kicking back across the bench seat. She doesn’t do it any more… perhaps because her legs are too long to fit now! I finally took a Nihola trike for a test ride and thought I would share my impressions. 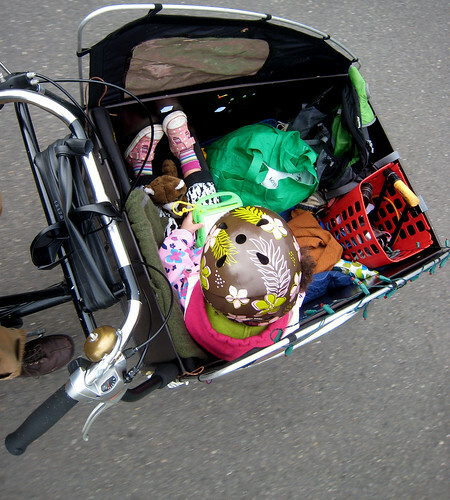 Nihola is a cargo bike company based in Denmark. Nihola trikes, like Christiania trikes, are popular among parents there, as well as businesspeople who want to haul stuff, advertise stuff, or otherwise use a bike commercially. 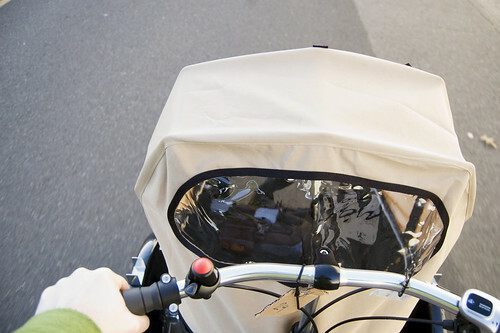 Like the Christiania, Nihola trikes have a well-designed rain canopy, and have design amenities specifically aimed at carrying one or two kids in the cargo box: the rain canopy, a sturdy bench, seatbelts, and a carriage design that maximizes head and legroom. Unlike most cargo trikes, the Nihola uses a steering linkage system. 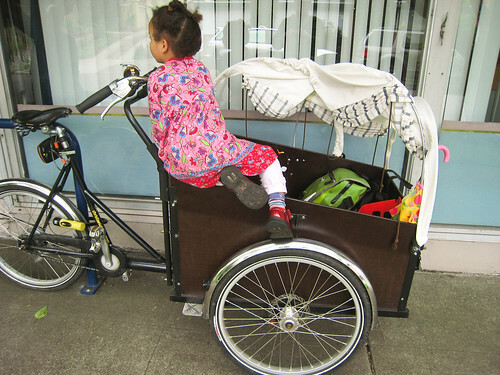 Most cargo trikes steer by using the box as the steering mechanism: the front wheels are on the box, and you steer by rotating the box on a pivot — the headset — which is positioned underneath the box, near the center. This sounds crude but can be quite sophisticated and well-engineered (as in the Christiania, with its inverse-angled floating headset, and hydraulic steering damper). Boxcycles, the US importer/distributor of Christiania trikes, is starting the new year off with a new Twitter feed and a contest to win one of their amazing cargo trikes. 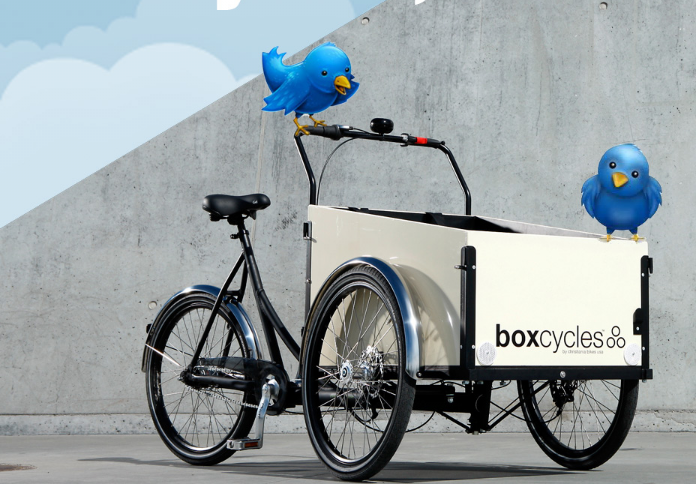 Follow them on twitter at @boxcycles and check out the contest information on their site to play along. 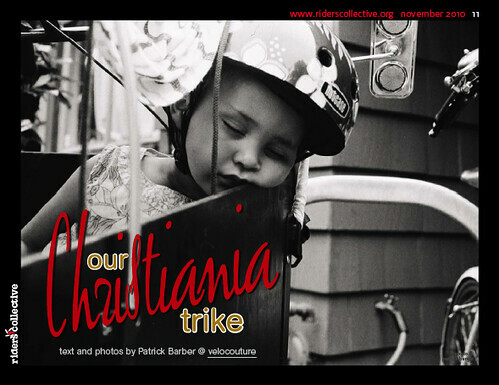 A few weeks ago, my extensive post about our Christiania trike was republished in Riders’ Collective, an online magazine that collects content from around the internet and edits and redesigns it into a magazine format. My Christiania article was featured in the November issue. Click here to download it. I added a conclusion to the original text; for some reason, this new content was not included in the Riders’ Collective version, but you can read the new conclusion in the original post. 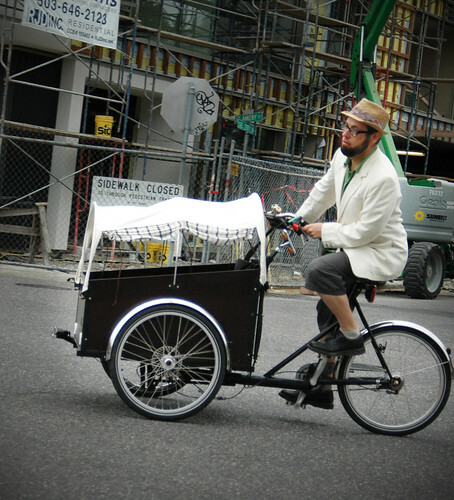 “Did you build that yourself?” That’s the first question most people ask us about our Christiania cargo trike. This question is followed shortly by “How can I get one?” And lately, a lot of people ask us about it, as interest in bikes like this has become more commonplace. Of course, I did not build our trike; it’s a specialized piece of equipment whose design has been refined over several decades by Christiania Bikes in Copenhagen. But the naïveté of the question reminds me that bikes like this are an oddity in North America. And it reminds me of how lucky I am to call this vehicle my everyday transportation.